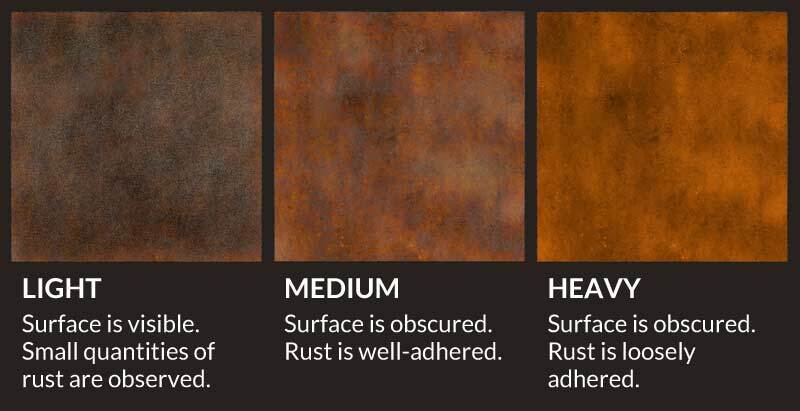 Rust Prevention | Gonneville Inc.
All metals corrode due to chemical reactions with the environment – with the exception of four rare metals: iridium, niobium, osmium and tantalum. When iron and iron alloys corrode we call it rusting. The product of corrosion is rust, aka hydrated iron oxide: Fe2O3.xH2O. Oxygen (O) is a highly reactive element. Only one element (flourine) has a higherelectronegativity – that is, more inclined to steal electrons than oxygen. Oxygen will form stable bonds with practically all other elements to form oxides. Iron (Fe) is an innoble metal, meaning it is inclined to give up electrons (unlike noble metals like gold and platinum, which don’t give up electrons, don’t react and don’t corrode under normal circumstances). Iron is the most abundant element on Earth, by mass. When oxygen and iron meet, oxygen takes iron’s electrons and they bond, forming iron oxide. This reaction, oxidation, occurs wherever oxygen meets the surface, creating a thin film on the substrate (less than 0.005 microns / 0.0002 mil thick). This passivating layer prevents further oxygen from contacting and reacting with the metal. Almost all metals form passivating oxide layers. Copper has its green patina. Silver has its tarnish. On stainless steel, a passivating layer of chromium oxide protects the steel from corrosion. However, in the case of iron and carbon steel, the passivating oxide layer is not so helpful. Not only does the brittle and bulky iron oxide layer not adhere to the substrate –thus providing no protection for the underlying iron – but is hygroscopic as well, meaning it draws moisture from the air. The presence of pure water on the surface by itself is not enough to cause corrosion. * But when the water contains dissolved salts, or is acidic or basic, conditions are ripe for the formation of a corrosion cell. *If pure water enters a crack or crevice, oxygen deprivation can cause a buildup of hydrogen ions, creating an acidic solution that can lead to corrosion. After oxygen, chlorine is next most reactive (electronegative) element. 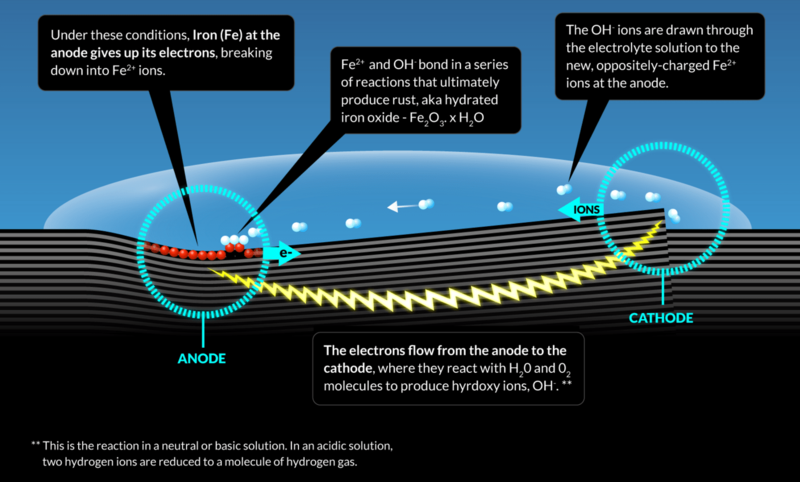 Chloride ions want to donate electrons, and experience strong attraction to the oppositely charged iron ions on the surface. 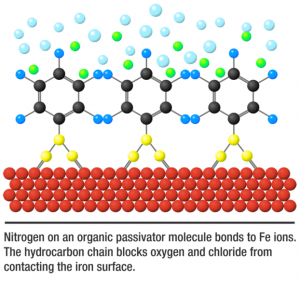 Pulled towards the surface, the chloride ions penetrate through the passivating iron oxide layer, reacting with it, and causing it to dissolve until the metal surface is exposed to the electrolyte solution and a corrosion cell forms. Corrosion that appears uniformly over most or all of the surface, due to the “dancing” movement of anodes and cathodes across the surface. Uniform corrosion accounts for more metal loss than any other form, but the effects are less likely to cause structural failure than localized forms of corrosion – yet still possible, if allowed to proceed unchecked. Corrosion that occurs in tight spaces between surfaces. 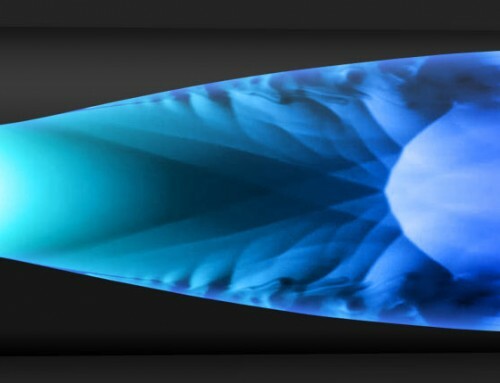 The shape of the crevice prohibits oxygen from entering and hydrogen ions proliferate (a process called hydrolysis) creating an acidic solution that accelerates corrosion. The rate of corrosion within crevices can be up to 400x the rate on a flat surface. Left unchecked, rust build-up in a crevice can lead to a rust mass that deforms surfaces, pushes apart plates and distresses structures. 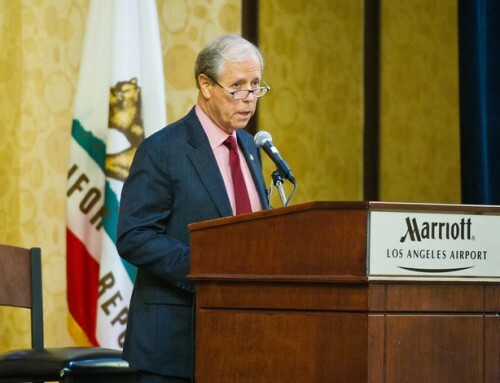 This difficult-to-detect form of corrosion can have catastrophic effects. As structural tensions create cracks in the substrate, rust forms in the cracks, weakening the structure through metal loss. Because iron oxides occupy more volume than iron, rust in a crack produces additional pressure that exacerbates the problem. Corrosion that occurs at the boundary where two different metals meet. Differences in the voltage of the metals cause an anode to form at the less noble metal, with the cathode at the noble metal. Recall that innoble metals are inclined to give up electrons, become ions, and oxidize. With pitting corrosion, metal loss at the anode corrodes a pit into the substrate, which can lead to perforation of the metal. It’s easy to underestimate the severity of pitting by visual inspection, because the pit can form a cavern beneath the surface, and the pit mouth can be obscured by rust. If left unchecked, pitting can cause structural failure. Pitting is a feature of all localized corrosion attacks. It is accelerated when aggressive ions like chloride (Cl-) are present in the solution, ie salt (NaCl) dissolved in water, because aggessive ions attack and dissolve the passivating layer. Flash rust is a general corrosion attack that presents a significant problem for abrasive blasters. 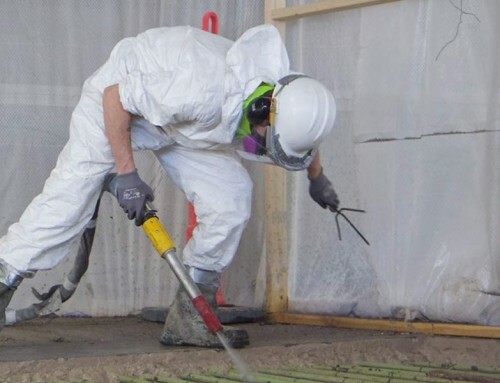 Blasting mechanically damages the passivating layer, which protects the metal from corrosion. In the case of vapor abrasive blasting, water is also present on the surface and in direct contact with the metal through the ruptured passivation layer. If there are salts on the surface, they will dissolve in the water to form an electrolyte solution and a corrosion cell will form. 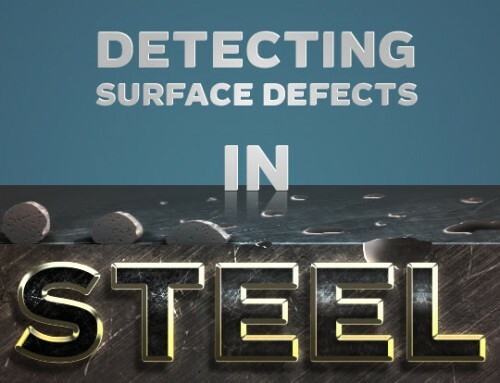 This fast-acting attack can cause visible rusting in as little as 30 minutes. 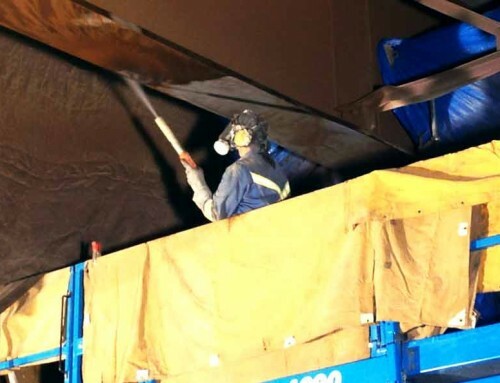 Flash rust is also a problem for dry blasting – and any kind of surface preparation. When the humidity is high, salts will draw moisture from the atmosphere onto the metal surface, forming a corrosion cell. Sodium chloride can pull moisture out of the atmosphere at 75% relative humidity. Other, less abundant salts draw moisture at as low as 25-35% relative humidity. With clean air (and a salt-free surface) atmospheric corrosion will not take place at relative humidity of less than 45%. But as relative humidity increases, the rate of corrosion increases exponentially. If you are blasting indoors, humidity can be controlled with dehumidifiers. Avoid blasting in the rain. Early-bird blasters beware: dew on freshly blasted steel is a problem. As the atmosphere warms, the metal remains cool longer and condensation forms on the steel. How much flash rust is acceptable? While light levels of flash rust can fall within tolerances for some coatings, in all cases they will degrade adhesion. Applying a coating over heavy flash rust will cause the coating to fail, as well as jump start further corrosive reactions. Check with the coating manufacturer as to acceptable levels of flash rust. Coatings specifications may indicate an acceptable time window between blasting and coating application. Pure water on a clean, flat metal surface will not cause corrosion. The corrosion cell requires an electroltye, and salt is the number one enemy. Not only does salt draw moisture from the atmosphere, but once dissolved in a solution, its aggressive ions erode the passivating layer to expose the metal, and the resulting electrolyte solution enables the ion flow required for a corrosion cells to form. So the first line of defense against rust is to remove soluble salts from the surface. Mechanical methods (hand and power tools, dry blasting) have proven to be largely ineffective in removing salts. But because salts are soluble, dissolving them with water is the preferred method. This is where vapor abrasive blasting shines. The pressurized water blast not only transports abrasive, but it dissolves salt and washes it away. Corrosion inhibitors can be added to a vapor abrasive blaster’s water supply to prevent flash rust, but they can also have unwanted side effects. Passivators create a protective film between the surface and the environment. Organic molecules like amines have free electron pairs that bond with the metal, and a long hydrocarbon tail to inhibit the adsoprtion of incoming aggressive ions to the metal surface. However, passivators have been known to interfere with coating adhesion and the effectiveness of anti-corrosive primers, especially those containing zinc, which must make contact with the metal to produce a galvanizing effect. Salt removers are chemically formulated to dissolve salts. These solutions disintegrate the oxide layer to interact directly with the metal. However, if not rinsed off, these often-acidic additives can leave other unwelcome precipitates on the surface that can cause osmotic blistering. Surfactants decrease the surface tension of water, making it “wetter”, which enables the water to better penetrate and dissolve the salt deposits. They can also assist in evaporation, and leave no residual contaminants on the surface. There are over 200 varieties of rust inhibitors. Many coatings will not tolerate them, not all are environmentally friendly, and some are known carginogens. Before using a rust inhibitor, ask the coating manufacturer for recommendations.